To keep from getting in a rut, we moved from portfolders to other projects. 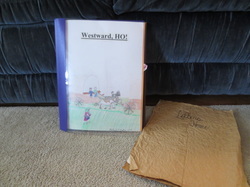 Like the portfolders, these projects are filled with original writing, drawings, captions, photographs, and assignments of all kinds, centered around a specific topic. The girls each made a scrapbook, documenting their studies of Egypt, Greece, and Rome. Although my oldest and and youngest daughters are four years apart, they could study the same topic while working at their own ability levels. I loved our one-room schoolhouse days! We used posterboard for the cover of our Middle Ages projects, cutting turrets in the tops. We pasted pictures and assignments to cardstock pages, which we then taped to the inside of the cover, one page overlapping the next. I needed some way to justify all the hours we would spend watching the 2008 Beijing Summer Games. Think, think, think. 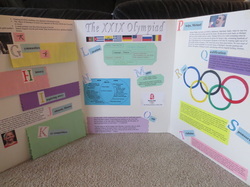 I found a trifold presentation board and asked the girls to do an A-Z presentation of the Olympics, which they worked on together. Perfect. All that time in front of the TV was educational and productive! I must have a thing for the alphabet! I gave the girls binders in which they included at least one page for each letter. Included in the pocket of each letter is a card with a brief overview of that page's word. We were able to extend the classroom for this one, going on a slew of field trips.